BWI is now above average for the year by slighly over half an inch. 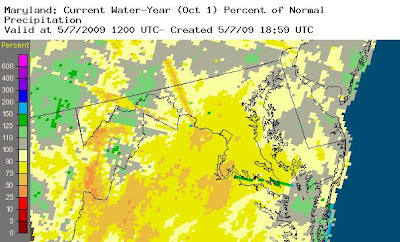 Although they don't include the locally heavy downpours since 8 am this morning, the water-year (since Oct. 1) and 90-day maps below show widespread areas from northern Virginia through Maryland (including the District of Columbia) at 90% or less of average precipitation amounts. So, although gardeners and farmers may be complaining about an excess of rainfall in the shorter term, longer term hydrological issues may be a concern if the current wet period fails to continue. Note from Baghdad-on-the Potomac: This post has been delayed by an hour thanks to repeated drops of the Comcast Internet connection. The Verizon land line backup went out of service on May 1 and is expected to require 18 days to repair. The latest U.S. Drought Monitor report, released this morning by the USDA and NOAA, shows that continuing rainfall in the past week has erased the minimal drought levels in most of the Mid Atlantic area. Maryland and Delaware have been completely removed from the Abnormally Dry category, and Virginia has been reduced from 85% to 53%. To the north, dry conditions are continuing in Pennsylvania, but its Abnormally Dry area has been reduced from 91% to 71%. In the Washington DC area, above-average spring precipitation has nearly wiped out the previous year-to-date deficit. At Washington National, just under an inch of rain yesterday brought the May total to almost 400% of the average to date. This amount was further supplemented by additional heavy showers overnight. Amounts were even higher in the Baltimore metro area, where many locations received up to 2" in the 24 hours ending at 8 am this morning. 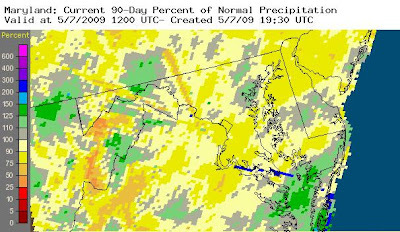 Images (click to enlarge): 24-hour total precipitation and 90-day percentage of average precipitation ending at 8 am EDT Monday, from National Weather Service Precipitation Analysis.